Poor Rob.. Things have seriously gotten out of hand. *shakes her head*. Wallpaper and background images in the Critical Analysis of Twilight club tagged: twilight robert pattinson fail edward cullen. This Critical Analysis of Twilight photo might contain workwear. haha, oh, poor Rob. even tv sees him as Edward now! AHAHAHAHA. I actually didn't get it for the first few seconds... which just shows how out of hand things have gotten. 1. Stock up on food supplies and live in a hidden underground bunker for ten years, re-emerging with a big hairy beard and the hope that Twilight fans have forgotten who he is and he can go on to live a life called Robert. 2. Give up, go with it, start wearing body glitter every day and accepting his new life as Edward. If I were him I'd choose to hide in the bunker. Poor guy musn't have had any clue what he was getting himself into. Ohhhhmygod. Man, that is one screwed up camera crew. Ah I noticed this when I watched it too. Poor boy. Rob: My name is Robert Pattinson. Crew: *tilts head to side* I don't get it. Oh dear, that's embarrassing!... He'll be known as Edward forever. ^^^ Yeah he does, doesn't he? HAHAHAHA! DANIEL RADCLIFFE WAS NEVER CALLED HARRY!! Regis and Kelly when he was 11. Regis dropped his notes and Dan bent down to pick them up and he started screaming "Harry, WAIT! NO! HARRY!" LMAO. 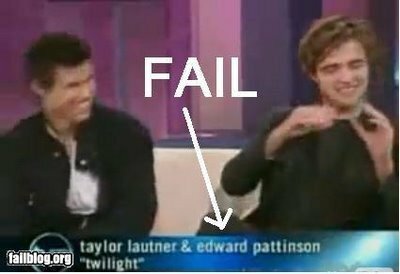 Edward Pattinson... XD Buahahahaha! Oh dear... Don't they have people who watch out for that? POOR EDDIE! I mean, Robbie! Ahahaha! LOL xD Some people just don't want to face reality. What a babe though, robert thomas pattinson ftw! Some know him as Rob, others will know him as Edward, but for me he is still Cedric!